When Bella, a two-year-old Dachshund came into the Emergency and Critical Care Service of the Wilford and Kate Bailey Small Animal Teaching Hospital, she was in terrible shape. Her face was swollen, she was having severe breathing difficulties, and her platelet count was practically non-existent. “She was at the point of death when she came in, there’s no doubt about it,” said Dr. Amelia White, an assistant professor of dermatology and a clinician in the teaching hospital’s Dermatology Service. Bella upon admission to the ER on June 16. Bella’s owners, Jerry Griffin and Debbie Harrelson, of Phenix City, Ala., were desperate. In March, they had taken Bella to their local veterinarian to treat a case of Demodex, a parasite that irritates a dog’s skin. After receiving an antibiotic to kill the parasites, Bella’s health began to decline. “She just lost all of her energy and wouldn’t eat anything,” Griffin said. As the months progressed and Bella’s condition worsened, Griffin and Harrelson began to lose hope that their beloved Bella would return to normal. By June 5, they brought Bella to the teaching hospital as an emergency case. Bella was admitted into the ER, where Dr. Lenore Bacek, an assistant professor of emergency and critical care, and her team immediately got to work. Just 24 hours later, a diagnosis had been reached: Bella was suffering a severe reaction to her Demodex medication. Harrelson, Griffin, Dr. White and Dr. Bacek then faced a critical decision: without treatment, Bella would surely die, but the solution was to conduct immune suppression treatment, which had a strong possibility of ending in death as well. “We knew the risks, and knew she was at the point of death, so we decided to go ahead,” Harrelson said. 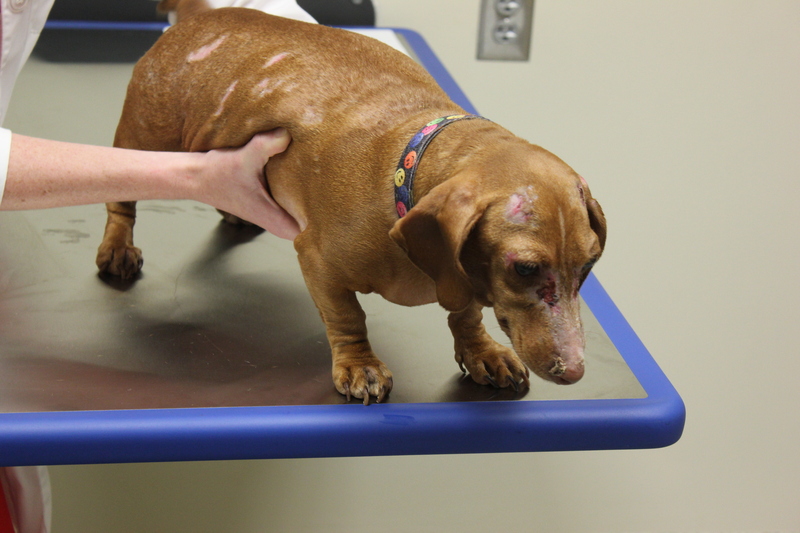 The decision made, the ER, Dermatology, and Ophthalmology services began to work on Bella. She responded well, and by the following day, the team saw improvement. Three days later, Bella’s platelet count was returning to a normal range. And while Bella seems to have recovered from the most serious illness, several health concerns remain and she is still receiving care. 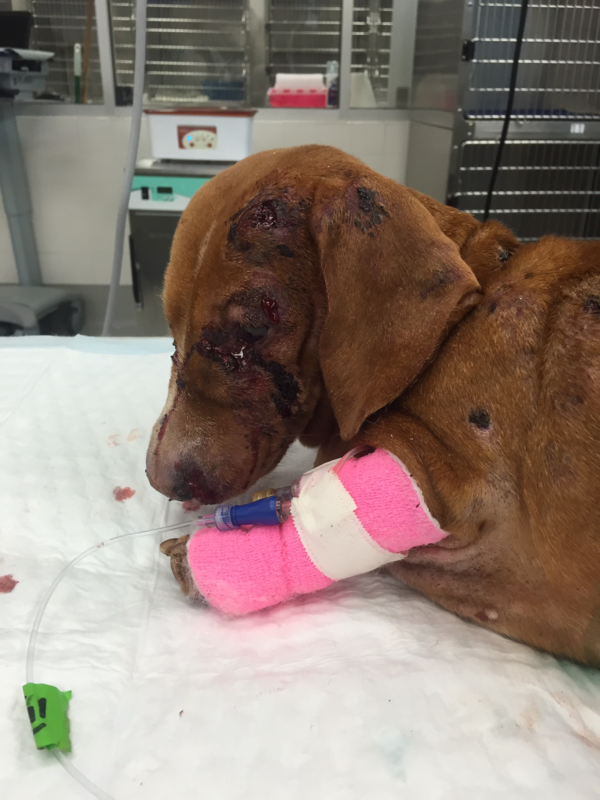 The lesions led to patches of dead skin, which are closing her nasal openings as they heal, and may require surgery. Her Demodex persists, and now that the main danger has passed, attention can be returned to treating it. Bella upon her discharge from the hospital on July 14. For Griffin and Harrelson, they couldn’t be more pleased or grateful for the care that Bella has received. “If we’d have known how good it was here, we’d have come much sooner,” Harrelson said. “They pushed Bella in quickly, and then I got regular phone calls, three or four times a day, just to let me know how Bella was doing.